The last 10 days have been packed full of birthdays, seriously, I think everyone I know was born in the same week! The fun started with my own birthday, then my Mum's and finally my sister's. You may have seen on Instagram that we celebrated with a girls night out to the theatre to see Matilda on Thursday. The run of birthday activities ended last night with a trip to the pub to celebrate my sister and her friend turning 30-something (on the same day - see, everyone!). I was drafted in to paint birthday nails for the guests of honour and am sharing both the designs with you today. I used Eat My Dust* from Barry M's new Speedy Nail Paint collection as the base colour. It's a lovely pale duck egg blue with a cool grey tint. I was amazed at how fast drying it really was, I hardly had to wait any time at all before starting the nail art - handy for someone as impatient as me! Of course my sister had no idea what she wanted so I was given free rein on the design. 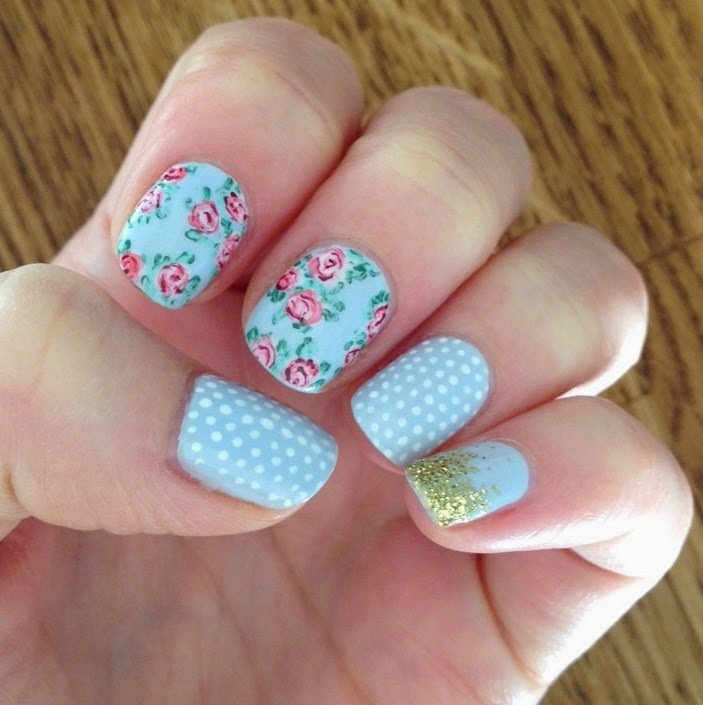 I decided to go for a vintage-ish theme with florals dots and a cheeky glitter fade! I used Models Own - Gold Finger for the glitter fade. The dots were added using a Barry M nail art pen, I really need a new one as it's running out and you can see all the dots are uneven grr. The florals were draw on with a small brush and various polishes including - Rosehip*, Chai*, Pink Flamingo, Red Wine and Road Rage* all from Barry M. I love florals and dots together and the touch of glitter just makes the mani a bit more special. The other birthday girl went for a more themed design with birthday candles and embellishments! The base is Barry M - Matt White and the candles are Greenberry, Blueberry Ice Cream, Pink Flamingo and Berry Ice Cream. I can't remember which orange I used for the flames but it was by Rimmel. The accent nail is Pink Flamingo embellished with tiny beads, the other accent nail has the rest of her new age but I won't reveal that on here! 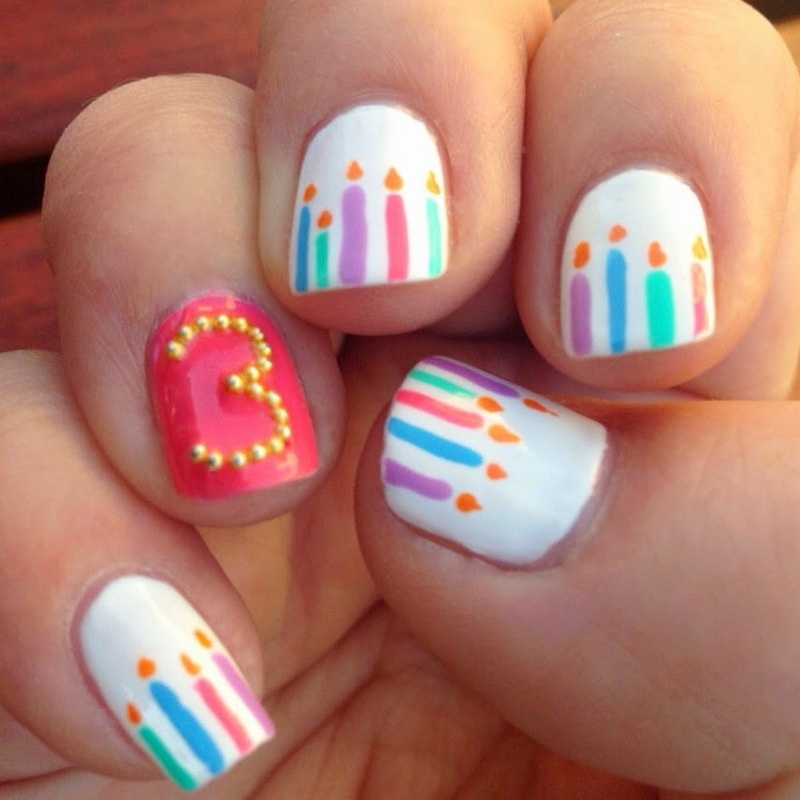 The candles were so simple to draw on with a striper brush and dotting tool but I think they look awesome! I've seen the design around a lot but have never tried it, now I wish I'd done it sooner, they're so cute. As well as doing the birthday girls' nails I tasked myself with baking them a cake. I love baking and like to set myself a challenge. Luckily both their names start with L, so I chose an L shaped cake decorated with smarties. The cake was three layers of vanilla sponge sandwiched together with buttercream and strawberry jam. I then iced it with chocolate buttercream and stuck on each smartie individually. I ran out of smarties and had to run out for more, I used 20 tubes in total, thank god they were on special at Sainsburys! It look absolutely forever to stick them all on and my hand was cramping up by the time I finished - just before the girls came round for their nails, oops!! I was so pleased with the finished product as it massively exceeded my expectations *proud face*. The boyf was roped in to sneak it down to the pub so the girls were totally surprised when we brought it out. I think everyone enjoyed it and it was great fun to make! Sorry to digress away from nails!! I'm a little sad that the big birthday period is over, I'll have to wait til summer for the next run of celebrations. I'm sure I'll find another excuse to bake before then though!